Every company, every team has their different traditions and specific culture and Microsoft is no exception. Christian Buckley of BlueBadgeMojo.com pokes some fun at what I think is a Microsoft specific tradition of “decorating” offices of people gone for an extended period of time. I remember carting in sand for a “beach house” office decoration way back. Where did it all start? I guess I’ll never know. 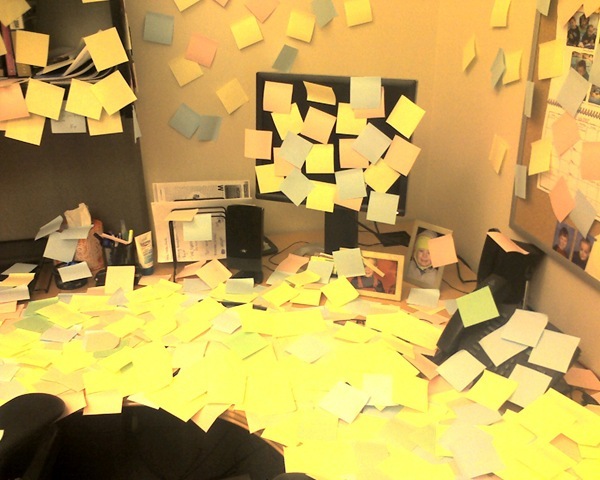 What funny workspace traditions do you have? Have you seen the office decoration thing outside of Microsoft? Posted in humor, microsoft, miscellaneous. When the RDC PM went on paternity leave, several of us in the offices around him covered all flat surfaces in his office in this immensely ugly baby wrapping paper. Not that this helps you for non-MSFT, but I figured I’d share anyway. It took me a long time to get his laptop wrapped in such a way that it was covered but still usable! Welcome back, David.Been missing your words while you were away.Congratulation with new baby.Write up (blog up?) soon. When I worked @ Theatreworks in palo alto years ago we had a tradition of “killing” people that left the company. we wrapped them in shipping cling wrap and photographing their “demise”. flown up on a winch, fed through a table saw, stuff like that. always two pictures, one for us and one for them to remember us by. Dear David:My question is about digital certificates in Word for Mac 2008. Is possible sign a Microsoft Word for Mac 2008 document whit a digital certificate ?Digitally signing a document has many benefits. A digital signature on a file is an electronic, cryptographic-based, secure stamp of authentication. When you add a digital signature to a document, you are supplying a verifiable signature that can vouch for the authenticity and integrity of the file. The certificate used to create this signature identifies the signer. Readers of your document can be assured of the document creator’s identity and that the document has not been altered since it was created. This is very, very important. See this link:http://www.cartaodocidadao.pt/index.php?lang=enHow to digitally sign a Microsoft Word for Mac 2008 document whit my Citizen’s Card ?This is in Portugal, but it has many, many countries with this system. Is possible of the Microsoft abus of its dominant position in the operating system market, again ?Is possible that for Microsoft the users of Word Mac 2008 are of second category ?Please, if you are the MACBU, this is very important. It is compatibility, transparency, interoperability between platforms, and not technology restriction.Best RegardsManuel SilvaPS: Office Mac 2008 in Portuguese Language ? Very funny tradition… The picture made me laugh!It’s really hard to read those comments though, being in a popup and almost without features. Have you seen Intense Debate? It’s a commenting system that will revolutionize the whole sphere, with profiles that follow you from blog to blog, threaded comments, and much more! If you’d like to give it a try I have some invite codes to give out… contactus@intensedebate.com if you’re interested!